I was in a posture of 'moving into' a new pad for the last four weeks and you know what a Herculean feat that is; at least, if not one the body . . . on the mind and soul. Got the good old sound system hooked up, moved the furniture in place (roughly) and proceeded to unload boxes of stuff I hadn't seen in years. Letters from Iron Man readers who have written me, old muscle mags and mementos up to the nose. While I mused over some of the old issues the stereo switched on one of many 'old' albums I (also) hadn't heard for years and years. So many of the older physical culture mags implored us to lift NOTHING BUT HEAVY WEIGHTS. Well, there's a time and a place for everything. And I'm going to get into that very thing in a moment. Take a tip from the weightlifters: cycle your heavy training. In other words, try to use NEAR maximal training poundages during regular workouts, but don't try to use ABSOLUTE maximal poundages (weights you can only get one or two reps with in good form) in every workout. You can't do that and keep good form going and stay injury free. Go for near maximal poundages once a week per bodypart. Once every two weeks you can really go for it; take the particular exercise you are trying to go heavy in and do a few extra sets; working up the poundages while dropping the reps. Say 6 sets instead of your usual 3 or 4 and doing a rep setup something like 10-8-6-4-3-2. Powerlifters and Olympic lifters have found by alternating their light (60-70%) and moderate (75-85%) loads they can 'cycle' this up to a maximum or heavy load (90% and above) on or near contest time. They nudge their poundages upward by cycling the workloads until they can train with max and near-max weights by a certain date - just in their preparatory training - prior to a given competition. When they hit the new plateau they start the cycle over again, but with some new weight adjustments and going somewhat heavier than before when they hit the 'heavy' point of the new cycle. Sounds a bit redundant or even a bit rambling (sentence-wise), but try to read it slowly to get the concept. The idea is that they may not hit near maximal poundages more than two or three times a month and go for broke only once a month. Different guys cycle it differently according to their individual needs and responses, yet they all do it, roughly, in this manner. There is a rhyme and reason to their cycling. It isn't that they're fleeing the inevitable destiny of checking out where they stand with a new poundage. While they are going somewhat 'lighter' (poundage-wise) on certain movements, they are doing more reps in it. AND . . . THEY ARE GOING HEAVIER ON ASSISTANCE EXERCISES. But you see . . . the lifter has different goals. At least generally; at times they want to build up certain bodyparts to help their leverages or give them the added muscle to strive for more strength. But we're talking about building muscle. Bodybuilding. If you train right you'll get the added benefits of tone, conditioning, etc. Right now we're talking about building muscle size . . . mass and density. Don't get so hung up in training poundages that you lose sight of what you're doing. "Well for Blinkety-Blank sakes, Green!" you say. "What the heck do you think I'm doing???!!! I'm trying to lifth weights!" That, dear friends, is probably where the concept gets muddied up. Especially for neophytes and many intermediates. 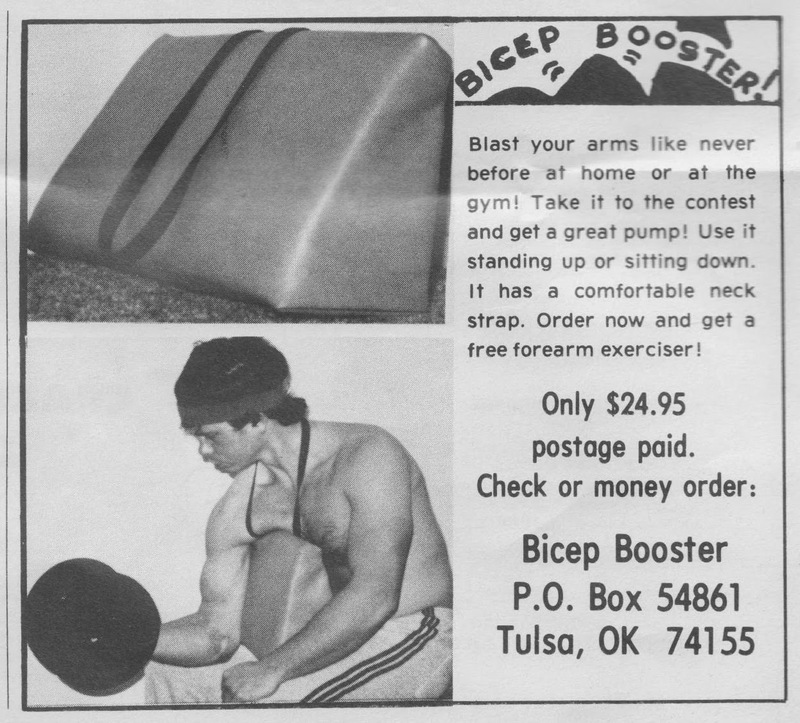 Maybe that's why the bodybuilding game adopted the term 'pumping iron.' No . . . not the flick . . . the term. In a way, pumping iron more actively and actively states the case; what it's all about and what the bodybuilder is really doing. Sure, you should try to use maximum poundages whenever possible, but cycle it somehow. There are so many variables, anyway: how you feel that day, your chemistry at the time, rest, recuperative cycles, job/family stresses and so forth. The idea is to OVERLOAD the muscle, not just with weight, but also with INTENSITY (of work level per set) and pinpoint concentration. Visualizing the muscle you are working, how you want it to look - getting down and dirty with that muscle or muscle group. With all the heavy duty type courses and the Arthur Jones' theory floating around the magazines today, I think some misconceptions are being derived from these articles. Sure Viator, the Mentzer brothers and guys like that train with comparatively heavy poundages AND get the reps, forced reps, et al., but they've worked up to it. They have thick attachments and can take it more so than others. I see new guys to the game trying to emulate these routines and get injuries all over the place. Injuries lead to 'down time' and no results, even going backwards. Yes, the idea is to train 'heavy,' but in relation to the workload on a given muscle. The poundages you use in a workout should be the main variable - more so than the sets or reps. Some days you'll lift heavier than others. The muscles only know if a weight feels HEAVY, MODERATE, OR LIGHT. If you've been doing 60 lb dumbbell curls, for instance, for sets of 6-8 reps and you come into the gym on an arm day and you're a little 'down' . . . the 60's might feel too heavy to get (even) 6 good, full, intense reps with. No biggie! Drop down to 55's and get your 6 or 8 good reps an then force an extra rep or two and maybe use negatives (fighting the lowering). You'll make gains. You overloaded the muscle. You worked it as maximally as possible. Eventually the 60's will get easier as time goes by and you'll be able to go up to 65's. The idea is to develop the muscle and the strength will come. In this case you want to develop the muscle first and foremost. The efficiency will come. If you want strength and power in a certain movement movement then you will have to train more SPECIFICALLY to that end. Of course there is more than one way to overload a muscle besides adding weight to the bar. Time is one. At Vince's Gym in the late '50s and early '60s you saw a different pattern of training emerge. I found it quite difficult, but very result-producing. Coming over from the Muscle Beach Gym and the early Gold's, I was used to taking longer breaks between sets. The beach denizens were naturally influenced by the weightlifters and power men and they did a little of both. Their bodybuilding workouts reflected this. At Vince's the better built guys rested less between sets. Sometimes only 30-45 seconds or less instead of the customary length of time. This is a level of overload in itself. It makes a BIG difference. Later on in the magazines it was referred to as QUALITY TRAINING. This aspect has been adopted by all the top bodybuilders when training for championship conditioning. The main idea is to rest as little between sets as possible. Naturally, on some exercises such as squats, heavy row and presses etc., where you're doing more sets, adding weight each set and dropping reps - you may have to rest a bit longer than 30-45 seconds. The main idea, though, is to just get your breath back and then go right into the breech. Don't hang out between sets. Wait until that muscle or muscle-group is is thoroughly worked before you take a bit of a break; while you're setting up for the next break. Unless you are on a specific bulk and power routine, get it on and keep the rests short. If you are a lazy bodybuilder then you should watch the clock and PUSH yourself until you get the rhythm. There are various other techniques of cutting the rest time down and OVERLOADING the muscle. These include super sets, compounding, tri-sets, giant sets, heavy-light and many other methods, all the subjects of individual articles. Suffice it to say they are techniques of alternating one or two exercises for the same bodypart with little or no rest. I know Peary Rader dislikes the use of the word, 'bodypart,' but it's becoming one of bodybuilding's slang expressions and has become widely used. So much so that it seems to state the case and is familiar to most enthusiasts. I've found that the use of slightly higher reps, pinpoint concentration and somewhat 'lighter' weights have definite purposes. The higher reps are not to be totally shunned. When working with beginners, I've found the use of higher reps imperative during the first few months. Starting out with a weight they can handle in perfect form, I always have them do 10-12 reps to start with. Abs and calves somewhat higher. The same goes for any aerobic work - it depends on their goals. But even for straight bodybuilding. Ten to twelve. As they get into better condition AND get stronger, I have them increase the reps to fifteen. Gradually. When they can do 15 good reps in an exercise I have them add a little more weight or resistance and back down to 10 reps. I may have them do this for a month or more depending on the level of the subject's response. At any rate, it seems to work better for almost all beginners. Several things happen: they build up more capillaries and better endurance of the muscles, they improve their tone more, condition the joints and attachments more effectively, burn more fat and stimulate their body chemistry more. Another important thing occurs: the trainee gets 'into' the exercises more and picks up on technique faster. Some trainers use this method more than others, but the ones that do get faster results. I've seen it in my own gym and others I've worked in for the last 15 years. There is another use for high reps that applies to the more seasoned bodybuilder. I can excite growth and nutrient stimulation to a lagging bodypart, muscle group or what-have-you. Not something you'd want to stay with for more than 2 or 3 weeks, but I've seen it do the job. Sometimes done in up to four weeks of high reps. Dave Draper and I tried it when he was training for the Mr. America and again (several times) during his training for the Mr. U.
I had heard Vince Gironda espouse this as well as the first Mr. America, Bert Goodrich. A great way to shock the body, build muscle density, striations, vascularity and the whole bit. I had watched Hugo Labra train with higher reps, yet he was strong AND big. It was a horrifying thought to us . . . to drop the precious poundages we had fought for so long to achieve. Particularly for Dave. He had been touted as the World's Strongest Youth and was mighty strong. Insecurity fell over us like a cloud. We finally got up the nerve to try at least 12-15 reps on everything. We could give it a shot for two weeks and work up to 20-25 reps on everything. We ended up doing it for three weeks. Hard at first, but oh so rewarding. We made gains in size, density and overall muscularity. We'd use the 3rd week to taper off and gradually increase the the training poundages and lower the reps a little at a time. Serge Nubret uses higher reps almost all the time and Sergio Oliva has been doing higher reps through most of his training the past year or two, and if you've seen him in recent exhibitions you can identify the improved quality and plenty of size he's developed. Generally speaking, 6-8 reps seems best for building mass in most arieas, yet areas like the back and legs seem to respond to 10-12 more efficiently. If your back is lagging (in any part) go to 12-15 reps per set, with as much weight as you can and see what happens. You'll be pleased. The calves and forearms seem to respond to higher reps due to their density and blood supply. In recent years it has been found more result-producing to alternate heavier movements for these two areas for 10 reps with somewhat lighter ones for 15 reps. Using more weight is not always the answer in bodybuilding. In fact, it can be contraindicated in many instances. Think about it: if the weight is too heavy, you have to do a faster movement; too brief to get all the deep fibers and really stimulate the myofibrils. You have to get at ALL the fibers. The fast twitch and the slow twitch. And then you have to build those capillary beds in and around the muscles. The pump - the blood supply - means so much to developing your body. Go as heavy as you can - when you can, but get the reps. Carry on and good luck!